Panasonic Corporation announced today that it has commercialized halogen-free, ultra-low transmission loss, multi-layer circuit board material, called Halogen-free MEGTRON6 (Representative part number: R-5375), suited for communications infrastructure equipment such as fifth-generation (5G) mobile communication systems. Production will begin in April 2019. 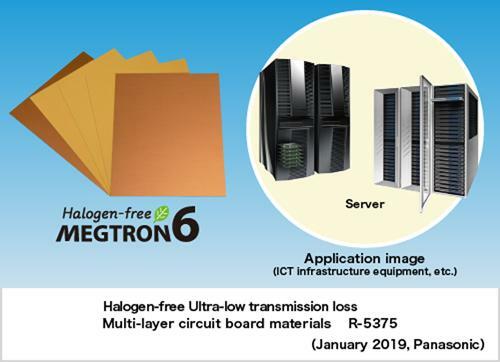 Panasonic’s new Halogen-free MEGTRON6 multi-layer circuit board material has the following features:1. Halogen-free material with a low transmission loss characteristic, contributing to higher-capacity and faster data transmission. This material, created using the company’s own resin design technology and compounding technology, offers excellent reflow heat resistance, insulation reliability, and high glass transition temperature as well as a high thermal decomposition temperature. This multi-layer circuit board material achieves high reliability in high-temperature environments, thereby contributing to reliable operation of communications infrastructure equipment. This material achieves outstanding ease of manufacturing and processing in producing multi-layer circuit boards with over 20 layers based on the company’s own resin design technology, and enables the adoption of environment-friendly halogen-free circuit board material in communications infrastructure equipment that requires very high numbers of board layers.